The Museum of Archaeology and Anthropology seeks to appoint a Senior Assistant Curator in Anthropology with either African or Asian expertise, to start on 1 September 2012 or as soon as possible thereafter. This British Museum exhibition about the pilgrimage to Mecca, a religious duty that all Muslims should undertake once in their lifetime, is awe-inspiring. Beyond the impressive range of material and visual culture associated with the pilgrimage assembled, the most astonishing aspect of the exhibition is the pilgrimage itself and the huge numbers of people who undertake it – nearly 3 million in 2011. The exhibition's designers and curators encourage this feeling of awe and large images of pilgrims in their multitude - embarking on their journeys, standing in contemplation and prayer at Arafat and circumambulating the Ka'ba - feature throughout the exhibition, including a jaw-dropping cinematic feature created for Imax. The exhibition also emphasises the extent to which the Hajj symbolises the diversity of Islam. Pilgrims come from almost every part of the world - West and North Africa, South Asia, South East Asia and the Middle East – and represent every section of society. The exhibition traces the historic routes and arduous journeys undertaken by pilgrims in the past underlining the huge commitment the pilgrimage entailed. 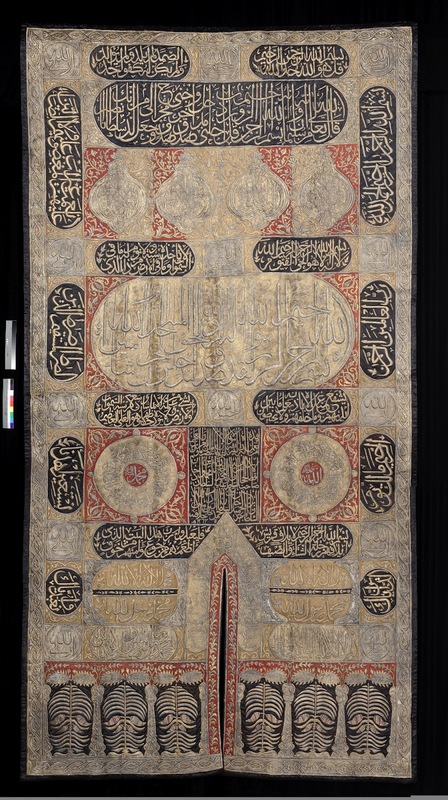 In describing 'an intensely personal experience as well as a collective public act' the exhibition also makes extensive use of first-hand accounts and most text panels include direct quotations helping non-Muslims gain an insight into the huge spiritual importance of the pilgrimage to Muslim people. Especially moving amongst these is an account of the Hajj handwritten in an exercise book by a young Shi'a pilgrim in 2006. Of her first sight of the Ka'ba she writes 'words cannot describe the emotions'. The book is accompanied by mementoes of her pilgrimage including a key fob and ID badge. In every sense the exhibition encourages the visitor to feel that they are joining the pilgrimage, aided by the shape of displays, which are fitted into the round reading room. The exhibition entrance is via a corridor along the curved side of the room and at the climactic centre of the exhibition a Ka'ba-shaped structure presents a number of stunning examples of kiswa, sumptuous, heavily-embroidered textiles made to cover the Ka'ba. Like the community that make the Hajj, the exhibition's visitor profile was refreshingly diverse. On the busy Saturday that I attended, Muslim families and Saturday faith school groups formed a large part of the audience. Against a backdrop of unfailing national suspicion about what it means to be British and Muslim there could be no better indictment of the positive aspects of a faith which unites communities across the globe. 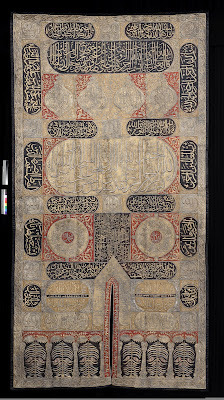 'Hajj - Journey to the Heart of Islam' is at the British Museum until 15 April 2012. The event comprises a two-day conference and associated exhibition. Digital, social and mobile technologies have unmatched potential to articulate a new role for libraries, museums, and archives. Three leading figures in the field will explore key issues including: What role does openness play in delivering new kinds of cultural value? Can new ways of using cultural content create immersive experiences for audiences? How best can digital culture be brought to an audience of billions? The long-term future of libraries, museums, and archives depends on delivering services that are relevant, meaningful, educational and inspiring to the widest possible audience. There is an ethical obligation to work with audiences and communities to ensure decisions are open, democratic and genuinely driven by user need. The session will look back at work achieved in making Collections Management more democratic and representative, and encourage delegates to think about future strategies to ensure their collections remain relevant. The way in which we move our bodies can express our multiple identities as well as our social and cultural backgrounds. Whether dancing, walking or playing sports, movement can be an affirmation of society’s norms, a celebration of community cohesion and a vehicle for expressing national and international affiliations. Equally, human movement can be a means of resistance demonstrating social and political unrest or an avenue for innovation and cultural change. 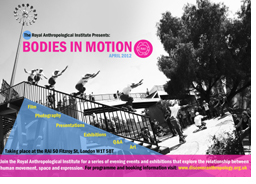 Bodies in Motion, is an initiative that explores the relationship between human movement, space and expression. Using photography, ethnographic film, art and presentations, the project aims to engage the public in exploring the meaning of movement in urban, digital and natural landscapes.